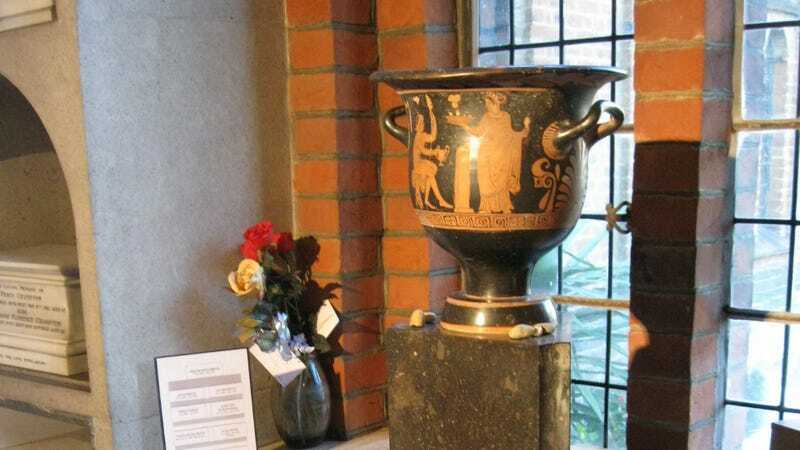 Back on New Year's Eve, some assholes broke into a crematorium in London and, in a botched attempt to steal the antique Greek vase containing the ashes of Sigmund Freud and his wife Martha, smashed the urn instead. As the Guardian reports, staff at the Golders Green discovered pieces of the urn on New Year's Day, which dates from around 300 BC, lying on the floor after thieves broke in and smashed it in an apparent attempt to steal it. The 2,300 year-old urn — which is now described as "severely damaged" — came from Freud's personal collection of antiquities. The item had been on public display since Freud was cremated in 1939; his wife's ashes were added in 1951. British police are still looking for the burglars. Detective Constable Daniel Candler called theft attempt as "a despicable act". "Even leaving aside the financial value of the irreplaceable urn, and the historical significance of to whom it related, the fact that someone set out to take an object knowing it contained the last remains of a person defies belief." Dawn Kemp, director of the museum in Freud's former Hampstead home, said: "It's a sad sad thing. It's very much a matter for the family, but Freud is very close to our hearts here, and we are deeply saddened at the news, whatever the motive was." Writer and campaigner Lisa Appignanesi, who is chair of the trustees, described the urn as irreplaceable. "It had been in his study for many years in Vienna, before the Nazi occupation forced the family exodus to England, to which he came, as he said, to die in freedom," she said. Staff at the crematorium have moved the damaged item to a secure location, and security at the facility is now being reviewed.